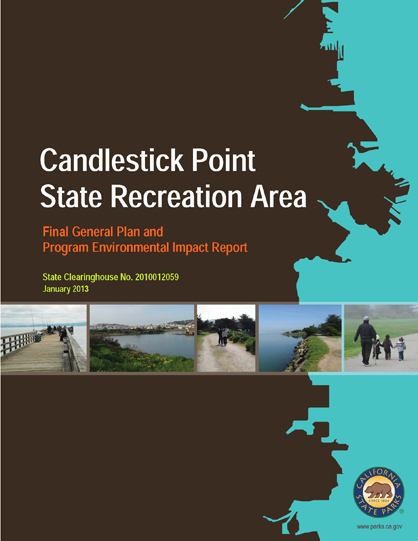 State Parks is pleased to announce the release of the Final General Plan and Program Environmental Impact Report (January 2013) for Candlestick Point State Recreation Area. The Candlestick Point State Recreation Area (CPSRA) Preliminary General Plan (GP) and Final Program Environmental Impact Report (EIR) / Response to Comments Document has been revised (December 2012) and is available at the link below. The Candlestick Point SRA Preferred Alternative, Newsletter #3, related maps and other information from the November 3, 2010 Community Workshop #3 are listed below. For information about the past two workshops (#1 and #2), please go to the bottom of this webpage. 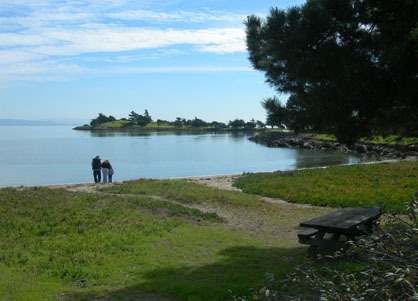 California State Parks and the City of San Francisco Redevelopment Agency invite your input as we begin plans to redesign and improve Candlestick Point State Recreation Area (SRA). Created in 1978 as California’s first urban state park, it is enjoyed by many for its unique waterfront recreation amenities. Popular activities include fishing, picnics, windsurfing, biking, and exploring the waterfront trails along the bay. The park is a local treasure, as it is one of the rare places along San Francisco’s industrialized Southeast Waterfront where communities can get access to the bay. The General Plan process is an exciting opportunity to plan for enhancement to the park. Trail improvements, better connections to local neighborhoods, habitat restoration, additional facilities, and youth programs are just some of the possibilities. The timing is ideal to take a fresh look at Candlestick Point SRA and make the most of opportunities to integrate it into these new land planning proposals. 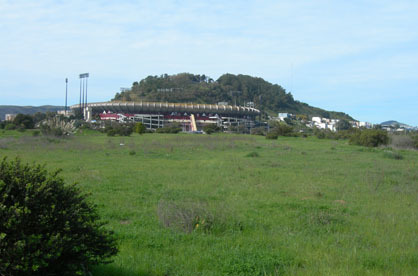 Candlestick Point SRA should continue to serve as the heart of the community - providing recreation opportunities, natural habitat, and access to the dramatic beauty of the bay. California State Parks has the responsibility for development of the Candlestick Point SRA General Plan and Environmental Impact Report. We look forward to working with the community to design a plan that will enhance the neighborhood and become an exciting destination for all Californians! We need your ideas! 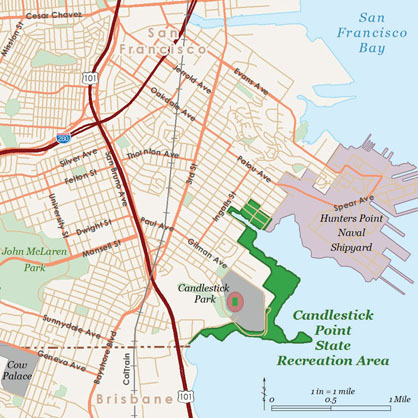 Candlestick Point SRA is located on San Francisco’s Southeast Waterfront, which is an area in transition that has been the focus of a number of large scale urban planning, infrastructure and development proposals. The City of San Francisco recently completed the Bayview Hunters Point Area Plan to guide future development in this area. San Francisco’s Redevelopment Agency just released the Draft Environmental Impact Report for the Hunters Point Shipyard Redevelopment Plan, which is being proposed by Lennar Corporation/Bayview Hunters Point Partners as the master developer. The Third Street Light Rail is now in operation, providing a vital new transit link for the community. To the north, Mission Bay is undergoing a dramatic transformation from old industrial land to a modern UC medical campus and new residential neighborhood. To the south, large scale mixed-use developments are being planned in Visitacion Valley and the Baylands area. With all of this development activity, a new Bayshore Intermodal Transit Station is being planned to provide a variety of train, light rail, and bus options to serve the area. Saturday, January 30, 10 a.m. Please join us for our first community workshop to share your thoughts and get involved in the planning process. Click HERE for more information. At this workshop, you will learn about the General Plan and Environmental Review process and be invited to share your vision for improving Candlestick Point SRA. San Francisco residents and agencies have been discussing plans for this park for years, but this is the opportunity for those ideas to take shape! The input collected at this workshop will be used to develop a range of alternative designs for the park, which will be presented at a future community workshop for feedback. This workshop will also serve as the scoping meeting for the project Environmental Impact Report (EIR). The alternative designs will then be refined and used to craft a draft General Plan and EIR. Additional public input will be sought before the plan is finalized. See you there! To learn more about the first General Plan/Environmental Impact Report Community Workshop for Candlestick Point SRA click here. Wednesday, July 14, 2010 from 6:00 p.m. to 8:30 p.m.